Some believe that prayer works. There are actually two factions of this belief. On the one side you have theists who believe that they can influence an unseen deity and petition to enlist its support on their behalf or the bahalf of someone or something. Why one would have to coerce an all-knowing, all-loving god to intervene on their behalf and go against “it’s plan” is a blog post all its own. Until that’s written, this one from the asundayafternoon.com blog will have to do.
? Why is there a “gap” ? But on the other side you have those that have measured some negligible, if not consistent, effect where prayer has been invoked in one’s own behalf or on the behalf of another. The underlying theory regarding the latter being the benefit of positive thinking or the Placebo Effect. While there is yet no hard data that shows prayer as either consistently effective or consistently ineffective, there is good reason behind this unique and innate human tendency to plea to external forces to act on their behalf. But this association, while understandable, begs further inspection. Some anthropologists believe that the earliest intelligent modern humans practiced a form of prayer. (1) Which seems to make prayer an inherently human act. When you examine the plight of the earliest modern humans, you can imagine why this behavior may have evolved. At some point, the earliest humans began to piece together the reality of their situation; that they existed in a world where they evidenced natural phenomena, which seemed to show indifference to their existence–seemingly randomly fluctuating between subjectively non-favorable acts like lightning and floods in one instance and subjectively favorable acts or complete indifference the next. Realizing a complete lack of control over and understanding of this phenomena lead them to form the assumption that there was some other force at the helm of the their world. This indifferent force being virtually unseen, sans the aforementioned evidence of its agency, left early humans with seemingly one option–to subjugate themselves to it with the hope of remediation of non-favorable phenomena and maximizing the favorable. In this we can see the beginnings of formal religion. Even in modern times this subjugation is still very much a part of our nature. Because even though, through science, we’ve begun to understand and demystify a considerable amount of things for which the earliest humans had no answer, there remains a great deal of phenomena (some of the exact same phenomena as experienced by early humans) over which we have no control as well as things concerning the world we inhabit about which we have little or no explanation–to say nothing of the seeming vast and infinite universe. So, like our early counterparts, we still have a reason and a desire to want to minimize the bad and maximize the good. But unlike our early counterparts, through the discovery afforded by science, we have less reason (if any at all) to rely on prayer in this endeavor. Prayer has become a behavior that bookends scientific inquisition and effective action; a knee-jerk, reptilian first reaction on the one hand and a last-resort when even science falls short. But even in this lower consignment, prayer is still an act humans still feel behoved to participate in(some more readily than others). Perhaps there is a good reason for this. Being that prayer is usually an act that one resorts to in the absence of any kind of effective personal practical agency–a sort of “just because there’s nothing you can do, doesn’t mean you should just do nothing” proposition–prayer is literally, the least you can do when there’s nothing else that can be done. This is not to minimize the act of praying, but to put its use into proper perspective. That use is as signaling. Economist Robin Hanson explains the signaling theory of human behavior as the motivation for our choices about school, shopping, medical care, and so on, (their pragmatic benefit aside) that have evolved primarily to shape other people’s perceptions of us(2). In the case of prayer, some may believe it has a pragmatic effect, but what we are really doing is signaling to others we care about them, or in the case of the aforementioned all-knowing, all-loving deity, to let him know you respect his power and enlist its use–never mind the cognitive dissonance of having to ask an all-knowing, all-loving deity to intervene in a situation. Leaving the merits of deistic prayer for another discussion, it’s suffice to say that the effectiveness of prayer, in its most easily measurable level of effectiveness is not evident in the mere quality of the plea or quantity of participants and their level of intent, but in its reception–not by an all-knowing and seeing progenitor deity, but by the person to whom the prayers are directed. This also applies indirectly to a situation over which one is praying, but it still comes down to a sentient agent’s reception of the plea and their ability to take action in hopes of affecting the situation. For example, when one can pray for the alleviation of hunger in a certain part of the world, we can be fairly certain that the mere act of praying alone (or “liking” on social media) has zero effect on the alleviation of that hunger, but it can, at least, be useful in several other aspects. One aspect is the raw acknowledgement on the part of the one offering the prayer, that hunger is a problem and that actual people are suffering. The second perspective is that of the hungry. They can become aware that their plight is acknowledged and that, perhaps something will be done to alleviate their hunger–hope is a good thing in itself. The third perspective, that of the person or people so inclined to do something to alleviate the hunger, and that they will, in fact, do so. The Sally Struthers Effect, if you will. A scenario that could have likely played out thusly: Person A prays for an end to hunger. Person B is now aware there is a hunger problem. Person B visits a third person, Person C–the hungry, and campaigns on behalf of Person C in the presence of Person C, inciting a fourth party, Person D, to provide the necessary means to provide the food to give to Person C, that will alleviate their hunger. Here, one could stretch and over-simplify the course of events of this scenario as: prayer helped alleviated hunger. Though you could easily argue that the act of prayer is wholly unnecessary in the above scenario–and you’d be right. Person B is dependent upon Person A only in the sense that this may have provided first inclination that Person C even existed. You could have easily substituted a newscast in place of the prayer in the above scenario as the thing that made Person A aware of the hunger problem. But what prayer signifies in these kinds of scenarios is a kind of quality or level of importance to the problem hunger in this scenario. As stated above, given that prayer is usually invoked in situations in which one feels a sense of helplessness, it conveys a qualitative sense of importance of a situation and as a plea to enlist the action of those in a position to help in a given situation. So, you could argue that even if a newscast was the impetus for making someone aware of a hunger problem, mentioning within the newscast that perhaps “millions are praying for a solution to the hunger problem” human nature being what it is, affords a qualitative degree of importance and caring–This problem is “this” important and we care “this” much. If only in this, prayer is a unique tool. But the result is not always good. Some studies have indicated increased medical complications in groups receiving prayer over those without. (2)(3) This negative aspect of prayer fits with the theory that the effectiveness of prayer (as signaling) is ultimately dependent upon how it’s received. In this study where prayer had a negative effect upon medical patients, you can argue two positions. One, that the mere fact of knowing that you are being prayed for could be taken as an indication, by the prayee, that their situation is of such dire circumstance and perhaps of such great import to a great many people, that its alleviation is insurmountable or hopeless. The other, more obvious and likely position being that the medical reality of the situation is beyond capabilities of the placebo effect and ultimately, beyond medicine’s current ability to alleviate it. 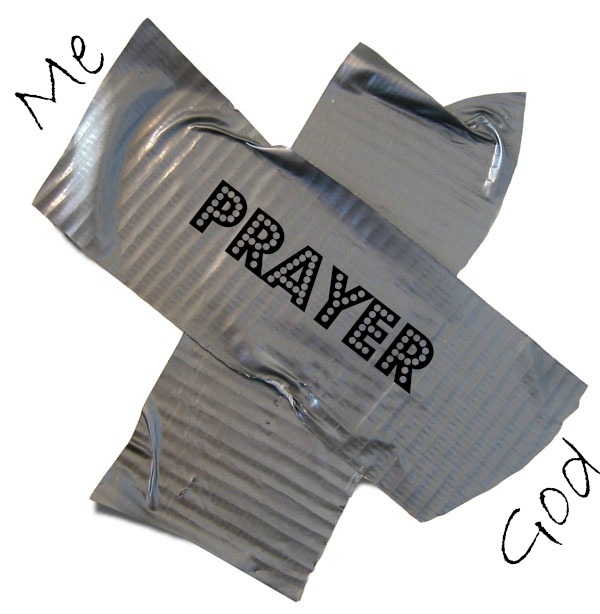 So even though the act of signaling “is as basic an endowment of man as his vision, hearing, taste and smell”–this “desire to be heard, known, and felt deeply”(4), as it manifests as prayer, it is little more than spiritual duct tape; it’s what you use when you don’t have your most effective tools at the ready.